Yesterday morning I found myself at Walmart. Walmart is the LAST place I want to go on a Saturday morning. The parking lot is full, the lines are long, and the place is a mess. Unless you get there before 9:00 a.m. Which is the LAST thing I want to do on a Saturday morning. Friday night, however, right after we put Lily to bed, we heard sobbing coming from her room. Ed and I both raced up to her room to see what was going on. It turns out that she was the ONLY witch in her preschool class, and she didn’t want to be a witch for Halloween. She wanted to be fancy for Halloween, and her plain, black witch dress just didn’t cut it. All her friends were either: 1. fancy princesses with wands that lit up, glittery shoes and shiny crowns, or 2. ladybugs. She was the only witch. Ed and I both understood. So the next morning found me at Walmart with Lily and Emmy, looking for a fancy princess Halloween costume. The only one that was left was way too big for her, but I knew there were dress-up princess dresses in the toy section. The only problem I faced was that once we got home, I knew Emmy would want a fancy princess dress, too. These dresses were $20 each, and I WAS NOT GOING to spend $40 on dress-up clothes. In looking further, I found something called a “Fairy Dress-Up Trunk,” and for $17 we could own 3 fairy skirts and shirts, and an assortment of fairy accessories. Fortunately, the term “Fairy Princess” fit right in to Lily’s fancy vocabulary, and we brought home the fairy trunk. The girls happily played dress-up for the rest of the morning, Lily was able to be a fancy fairy for Halloween, and both Ed and I were able to have two little happy girls. If they’re happy, we’re happy! Poor sweet thing! They're adorable all dressed up. I'm so glad it worked out! Poor thing! I'm so glad you found a costume she liked. She's a total cutie! They both are and even the neighbor boy! They're so sweet, I totally understand running out for a costume. It's so hard for them when they feel like they're not fitting. I'm glad the dress up trunk turned out to be an easy fix. That bunny costume is too much though. I love it. The thought of her lying in her bed, thinking about her costume and crying–argh! It does break your heart. You're a good mommy to brave Wal-Mart on a Saturday! You saved the day! The girls look so cute in the pics! Oh, they are all so cute! 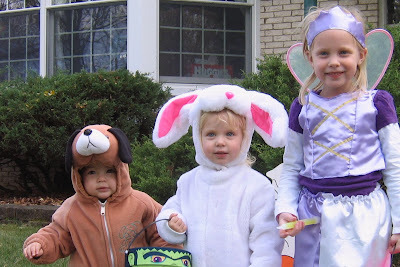 Hope they had fun trick or treating and that the Fairy Princess raked in a lot of candy! They look adorable. Sounds like you did some great shopping! Doesn't it just break your heart when they are hurting.